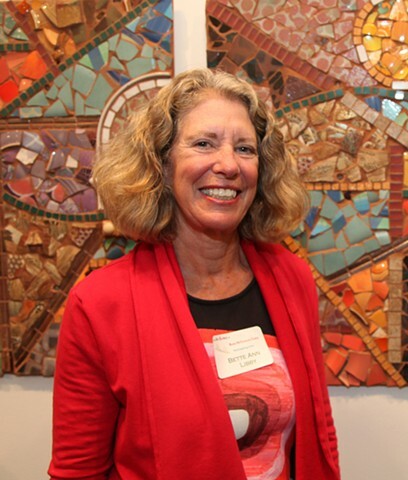 Bette Ann organizes community ceramic shard mosaic workshops and installations. For 15 years, she has worked with groups to create numerous projects, which are permanently located in hospitals, schools and libraries. Bette Ann is passionate about fostering the creative experience as a vehicle toward community connectivity and feels that installation art is essential to well-being. Libby's images have been inspired by her teaching in Samoa and travels in Europe, Asia, India and the mid-east. Over the past 35 years, she has received numerous awards for her work, which has been exhibited in museums and galleries throughout the US. Bette Ann founded the sculptors’ collective, “Studios Without Walls”, which has received more than 16 MCC/BAC grants for environmental installations in Brookline, MA.